Black Lightning Comic-Con 2017 Plans Revealed! Details about a Black Lightning panel at Comic-Con 2017 have been confirmed! Sadly tickets are already sold out, but if you’re planning on attending the Comic-Con International in a few weeks, there will be a few Black Lightning treats for you! First off, there will be a “special video presentation” set for Preview Night (Wednesday, July 19 at 6PM). There was no full pilot shot for Black Lightning so we’re not entirely sure what will be shown, but here’s how the show is described as it runs during this multi-hour event in Ballroom 20! Black Lightning: Jefferson Pierce (Cress Williams) is a man wrestling with a secret. As the father of two daughters and principal of a charter high school that also serves as a safe haven for young people in a neighborhood overrun by gang violence, he is a hero to his community. Nine years ago, Pierce was a hero of a different sort. Gifted with the superhuman power to harness and control electricity, he used those powers to keep his hometown streets safe as the masked vigilante Black Lightning. However, after too many nights with his life on the line, and seeing the effects of the damage and loss that his alter ego was inflicting on his family, he left his Super Hero days behind and settled into being a principal and a dad. Choosing to help his city without using his superpowers, he watched his daughters Anissa (Nafessa Williams) and Jennifer (China Anne McClain) grow into strong young women, even though his marriage to their mother, Lynn (Christine Adams), suffered. Almost a decade later, Pierce’s crime-fighting days are long behind him…or so he thought. But with crime and corruption spreading like wildfire, and those he cares about in the crosshairs of the menacing local gang The One Hundred, Black Lightning returns — to save not only his family, but also the soul of his community. Based on the characters from DC, Black Lightning is from Berlanti Productions and Akil Productions, in association with Warner Bros. Television, with executive producers Greg Berlanti (Arrow, DC’s Legends of Tomorrow, The Flash, Supergirl), Salim Akil & Mara Brock Akil (Being Mary Jane, The Game, Jumping the Broom, Girlfriends) and Sarah Schechter (Arrow, DC’s Legends of Tomorrow, The Flash, Supergirl). 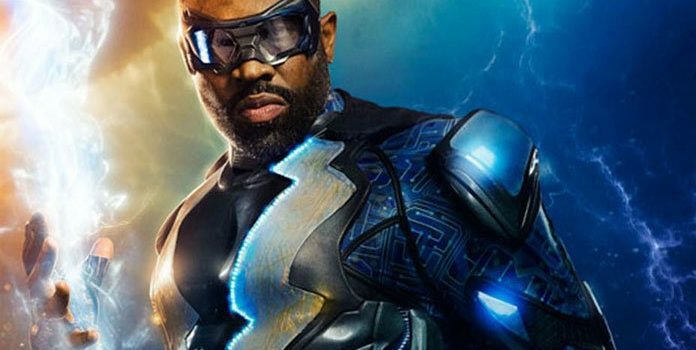 Black Lightning premieres midseason on The CW. 4:50–5:10 p.m. Black Lightning Special Video Presentation and Q&A — Black Lightning makes its Comic-Con debut! Jefferson Pierce (Cress Williams) is a man wrestling with a secret. As the father of two daughters and principal of a charter high school that also serves as a safe haven for young people in a neighborhood overrun by gang violence, he is a hero to his community. Nine years ago, Pierce was a hero of a different sort. Gifted with the superhuman power to harness and control electricity, he used those powers to keep his hometown streets safe as the masked vigilante Black Lightning. However, after too many nights with his life on the line, and seeing the effects of the damage and loss that his alter ego was inflicting on his family, he left his Super Hero days behind and settled into being a principal and a dad. Choosing to help his city without using his superpowers, he watched his daughters Anissa (Nafessa Williams) and Jennifer (China Anne McClain) grow into strong young women, even though his marriage to their mother, Lynn (Christine Adams), suffered. Almost a decade later, Pierce’s crime-fighting days are long behind him…or so he thought. But with crime and corruption spreading like wildfire, and those he cares about in the crosshairs of the menacing local gang The One Hundred, Black Lightning returns — to save not only his family, but also the soul of his community. Join series stars Cress Williams (Hart of Dixie, Friday Night Lights), Nafessa Williams (Twin Peaks), China Anne McClain (House of Payne) and Christine Adams (Marvel’s Agents of S.H.I.E.L.D. ), along with executive producers Salim Akil & Mara Brock Akil (Being Mary Jane, The Game, Jumping the Broom, Girlfriends) for an exclusive sneak peek at the upcoming series along with an electrifying Q&A session. Based on the characters from DC, Black Lightning is from Berlanti Productions and Akil Productions, in association with Warner Bros. Television, with executive producers Greg Berlanti (Arrow, DC’s Legends of Tomorrow, The Flash, Supergirl), Salim & Mara Brock Akil, and Sarah Schechter (Arrow, DC’s Legends of Tomorrow, The Flash, Supergirl). Black Lightning premieres midseason on The CW. You can find a full Comic-Con Warner Bros. TV schedule at KSiteTV.